How do you find time to write? I’m a homeschooling mom of four who writes and I mostly feel too exhausted by the time they’re in bed to do anything but binge on Netflix. That’s a great question! As a homeschooling mom of seven I often feel exhausted. There is always so much to do. I’d be 100% busy if I didn’t write at all. Writing for me comes down to two things: 1. the choice and 2. deadlines. I have deadlines with publishers that I have to meet and I have to make hard choices to meet them. I often wake up early write—like 4 a.m. I also take my computer with me when we have appointments such as speech therapy and occupational therapy, and I write in the waiting rooms. I also hire a babysitter about 8-10 hours a week to watch kids so I can write. Of course that means ignoring the laundry, ignoring the messy house, and ignoring all the things I want to watch on TV. I rarely have time to watch TV. I might watch a show or two a month. Sometimes I’m tired when I sit down to write, but once I get going the ideas excite me and it becomes easier. The hard part is just getting started! I’ve learned over the years to just start. Happy Mail from Tricia: Michelle C.
Tricia how do you manage to concentrate on your writing in a waiting room. I’m afraid that I would be side tracked by the noises and activities of the busy people around me. You are a very busy and focused person. Thanks so much for your giveaway . God bless you and may you reach your dead lines. What was the hardest obstacle to overcome when writing your first book? I never wanted to write very much but I know how busy you are with homeschooling. I homeschooled all four kids and the oldest was 19 and in college when the youngest was born. The last 20 years of homeschooling I held down an outside job as well. And my husband got a Masters and was working on a dissertation for a doctorate during that time . Nobody got. Much sleep. Hang in there. You’re doing great! 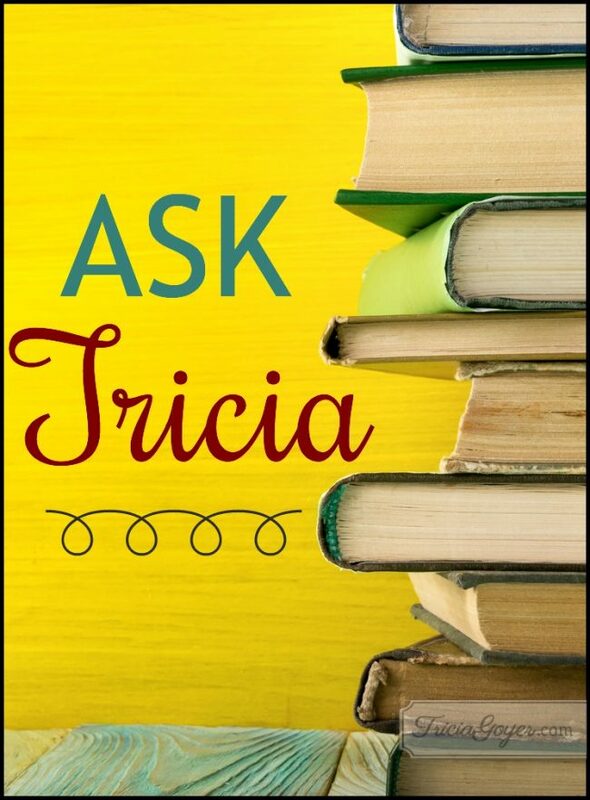 Tricia, how do you think of what to write in your blog. Your blogs are wonderful and I always enjoy reading it. Thank you! How do you decide what the subject of your books will be? I enjoy reading your books. What are your tips for cooking for such a large family? As a fellow writer I am wondering what truly motivates you to find new subjects? As a fellow writer I am wondering what truly motivates you to find new subjects? I love your work. Tricia, do you ever miss Montana, and have you been back to visit since y’all moved? I do miss Montana. We go back once a year. Last year we went for a month in the summer. It was a wonderful experience. Do you generally map out an outline of the book you write first or do you begin and watch it unfold yourself? Good advise. I often tend to tell myself to just sit down and write but have a hard time taking it. The book series sounds interesting; it reminds me of the musical. Look forward to what you are writing next. Thanks. I love that you are an advocate for adoption. We adopted our two daughters each as newborns. What are some of the challenges and blessings of adopting children who are older? I am amazed at all that you accomplish! You are certainly a person to be admired! Do you have an all-time favorite story that you’ve read?